Bonnie Loukus works as Assistant Director at the Copper Country Community Arts Center, a non-profit organization, in Hancock, Michigan. 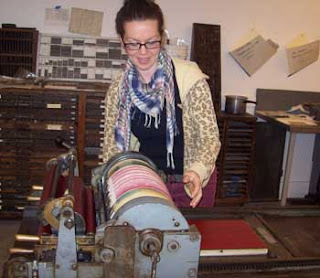 She is currently working towards establishing a letterpress and book arts studio within the center. 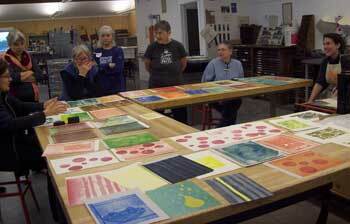 At PBI in May, Bonnie had the great fortune of taking letterpress class with Sarah Bryant. Thank you, Bonnie, for telling us about the class. As I have become more involved with letterpress and bookbinding the past couple of years, I saw this class as a perfect opportunity to combine my old love (painting) and my new love (book arts). This was my first time at PBI and I wasn't sure what to expect. Knowing absolutely no one, being pretty new to the whole book arts scene, and prone to bouts of stifling shyness, I wasn't sure what was going to happen. I'm happy to say, it was incredible. Topnotch instructors and intense studio time in a gorgeous environment with kind and interesting people. I learned so much and made book arts buddies from all over the place. Who wants to go back home? Ever? Yet we did have to go home and luckily a nice thing about technology is that it helps keep these new connections with people going through e-mail conversations, collaborations, and knowledge sharing. Like this blog! So, the instructor for Pressure Printing: A Painterly Approach to the Press was Sarah Bryant of Big Jump Press (www.bigjumppress.com). Sarah is a combination of letterpress ninja, energetic motivational presenter, comic relief...and of course, an amazing printer/artist/lady. If you have ever been fortunate enough to attend PBI you know the first week is broken into two sessions with about twelve students in the morning, twelve in the afternoon. With that said, there was exactly one Vandercook to use for 24 students. Sarah was able to keep us all on task and bestowed her magic-juju-catchphrase "Cross your fingers, turn around three times, and spit!" to help our prints turn out their best. It must have worked because everyone's pieces were so varied and beautiful. Pressure printing is a form of relief printing and differs from traditional printing in the way that image/text you print is behind your paper on the feed board of the Vandercook, instead of on the bed itself. You create a "plate" that is placed behind your paper. The plate can be paper or mylar with your created image(s) cut and pasted on with spray adhesive or glue stick. The impression is adjusted by placing packing (sheets of paper) behind your plate before you print, in order to get the desired amount of ink for your image. Too little packing, and your image will not show up, too much and it could be obliterated when the paper and plate meets your inked surface. An exact science it is not....and of course the majority of letterpress printing is pretty exact. This way of printing lends itself to all kinds of experimentation. 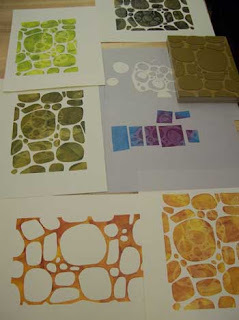 I chose to keep it simple, but many students planned and printed multiple images and textures within one piece. The type high block on the press bed acts as your inked surface. 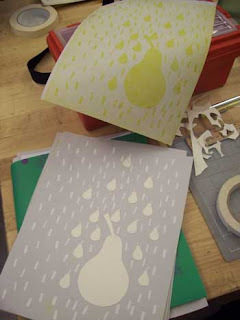 It can be inked by the press rollers or with a brayer. You can also get fancy and carve into the block or cut images to place on top of this block. Others more well versed in printing, like my Vandercook buddy Suzanne Sawyer, experimented with creating both a plate and an inked surface with a relief image. Suzanne is a very talented artist who incorporates images of plant cells within her work and she chose to do so in this class as well. I think she really achieved a beautiful aesthetic while showing what one can do with pressure printing. I loved the subtle wash of color from pressure printing, not having to use any kind of measuring device, and the ability to just cut paper to create images. If there had been more time, I certainly would have enjoyed experimenting with the interaction of colors and the inks, carving a block, and monkeying around with the amount of packing. I think the best approach for me with PBI classes was to try and really treat them as a learning experience; to focus on the process and learn from it, rather than trying to make an amazing work of art at the first go. This was a hard thing to do at times with all the book arts rockstars about, but it kept me from stressing too much about the end product. Like when teaching children, I had to remind myself it's not about being done first, but to check myself to see if I understand what I'm doing, not be timid about asking questions, and assess if I am putting forth my best effort. This was truly an inspirational and timely class as I continue my adventure into the world of book arts. So nice to hear Bonnie's experiences! I can't wait to hear more when I se her. I would love to go to PBI someday.